I just read through the first 135 pages of the recently released 320 page OECD Development Co-operation Report 2017-Data for Development. The first part Making data for development is followed by detailed profiles of all the members of the organization’s Development Assistance Committee (DAC) which I am skipping for the moment. 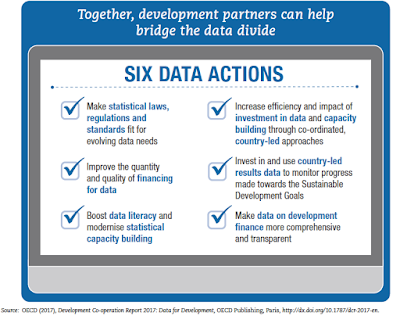 Besides a general discussion about the value of annual ‘flagship reports’, the document is an important artifact to learn more about the consensus that an organization like the OECD presents when it comes to a topic like data for development. The report is visually appealing, chapters are well referenced with contemporary literature and most of them provide good summaries of the topic. 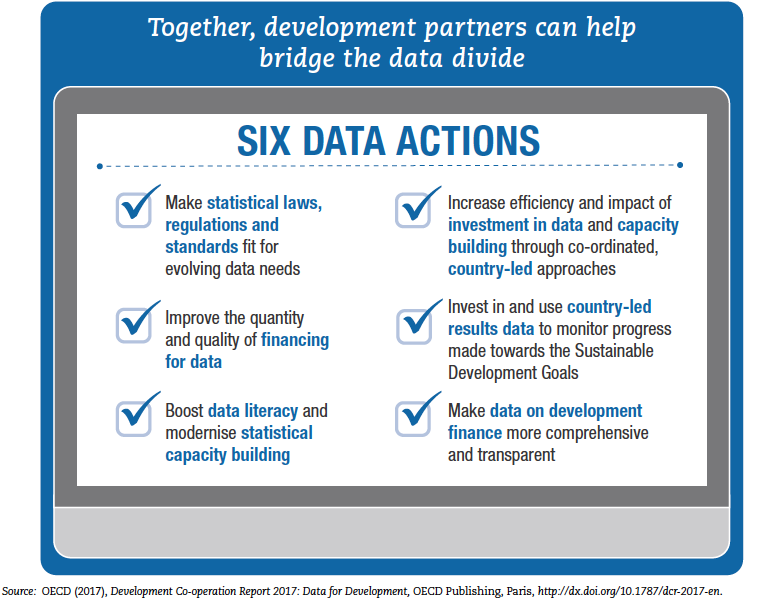 And the overarching message that good data systems to achieve the SDGs are important and often lacking is a necessary reminder for the OECD-DAC community. But as a researcher and teacher I am also interested in approaching such a substantial document with a critical, perhaps even discourse critical lens to understand how the highest levels of development policy-making embrace a new challenge. Almost right from the beginning of the report (‘The data revolution has tremendous potential to inform innovative development policies and open new doors for individuals in developing countries’, p.15) ‘data’ is presented as a fairly stable entity, something statisticians manage in a database on a computer hard drive. Data does not seem to be part of a digital ecosystem. Yes, data can be a digitized land record database, but data is also the fuel behind machine learning, algorithms, automation (a.k.a. robots), platform capitalism, social media, drones and so much more. I am certainly not arguing that OECD countries themselves have the infrastructure and regulations in place to understand everything from 3D printing to ‘the Internet of things’, but I was surprised of how isolated ‘data’ was often presented. Such an approach limits the discussions to traditional topics of capacity-building or enhanced cooperation and leaves out transformational aspects-both good and bad. To build inclusive gender ecosystems that benefit global development and individual citizens, governments will need to transform their legal and strategic gender frameworks. Over the past two decades, developing countries have taken steps to reform their national gender systems. Nonetheless, significant challenges remain, including the absence of legislative frameworks for gender. The growing number of public, private, and civil society actors and institutions involved in the production and use of gender make the need for clear legal, ethical, and quality standards and protocols even more urgent. These should regulate the use of traditional as well as new and non-traditional sources of gender, fostering the trust that is needed for gender to inform good policies and development results. To build inclusive participatory ecosystems that benefit global development and individual citizens, governments will need to transform their legal and strategic frameworks for participation. Over the past two decades, developing countries have taken steps to reform their national participatory systems. Nonetheless, significant challenges remain, including the absence of legislative frameworks for participation. The growing number of public, private, and civil society actors and institutions involved in the production and use of participation make the need for clear legal, ethical, and quality standards and protocols even more urgent. These should regulate the use of traditional as well as new and non-traditional sources of participation, fostering the trust that is needed for participation to inform good policies and development results. Data then becomes part of the next toolkit and checklist, but there is also the bigger problem of how to present such a report with so many stakeholders involved in a way that every member signs off. Citizens want to hear real stories behind development. (…) Citizens want to hear from beneficiaries of aid, passionate field workers, not just politicians, diplomats or celebrities (p.104). He talks about ‘technical capacity building’, enabling ‘national statistical offices’ to become ‘chief data managers’; there should also be a ‘framework of knowledge solidarity (…) across the globe’ (p.61). In another contribution, the author lists high-level commitments to statistics, sharing documents and global gatherings since 2004 (p.85). So this is about trainings, office setups, global conferences discussing global guidelines, meetings, jobs, hardware, software…an apparatus, a habitus of how data and statistics become professionalized. This is literally about who counts and what counts, reimaging the state of the 21st century! 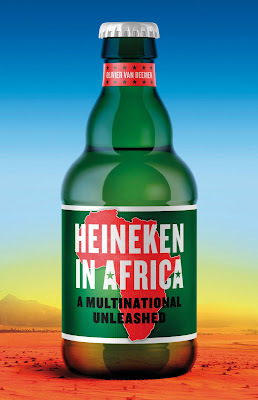 If you now add global companies owning specialized software, cloud storage or other services to the picture we should be discussing the risks of digital neo-colonialism! (A Rohingya database) can digitally enable discrimination. Rohingya have to follow a ”code of conduct” that forces them to stay inside the camps and limits their interaction with locals. If the database of Rohingya people were to be leaked, hacked, or shared (for example, with the Myanmar government), it could make it easier to deny Rohingya access to basic services, or target them, or discriminate against them. For example, Bangladeshi mobile phone operators have been banned from selling SIM cards to Rohingya refugees. Biometric data could in theory be shared with mobile phone operators to enforce the ban. This is from Zara Rahman’s recent commentary on the IRIN news site. Urgent humanitarian debates and many of the ambiguities and challenges behind (big) data cannot hide by sprinkling in a few words around ‘responsible’ or ‘secure’ use of data. In the end, the OECD report assumes an intrinsic motivation for governments to embrace data and statistics for better, evidence-based decision-making. The evidence from Myanmar, North Africa, Cameroon, Turkey or Zimbabwe is that ‘data’ is already part of complicated battles and power/knowledge struggles in traditional and new public spheres.